The Red Arrows will be joined by the newly formed U.S. Air Force F-35 Lightning II demo team. Members of both the U.S. and British air forces will co-headline this year's Oregon International Air Show in Hillsboro this fall. 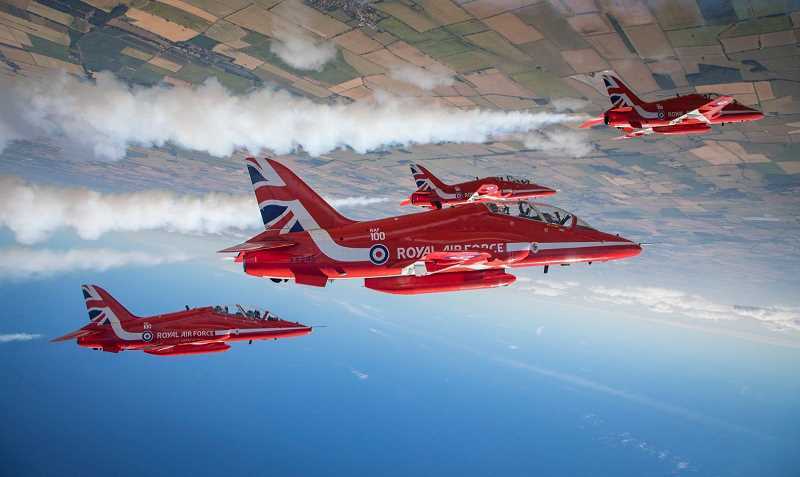 The British Royal Air Force's Red Arrows Aerobatic Team will perform at this year's air show, officials confirmed Friday, Feb. 8. This will be the British flight team's first-ever appearance in Oregon and their first North American trip in more than 15 years. The nine-member aerobatic team perform in BAE Hawk T1 aircraft, flying loud and fast in a number of unique formations, according to air show spokesman Stacey Stathulis. The Red Arrows will be joined by the U.S. Air Force's F-35 Lightning II Demo team. While the Red Arrows have performed at air shows across the globe for more than 50 years, the U.S. Air Force's F-35 Lightning II Demo team formed this year. The team is performing at only a dozen shows across the country this year, said Oregon International Air Show President Bill Braack. "Wow," Braack said. "I can't tell you how excited we are to be hosting one of the top military jet teams in the world, the Red Arrows, along with hosting the F-35 demo in its first-ever season. To have both of these demonstrations in one year is simply unbelievable and makes this one of the top air show lineups in the U.S. for 2019." Proceeds from the air show are donated to local charities and non-profits across Washington County. The Air Show has donated more than $3 million to local organizations since 1988. The 2019 Oregon International Air Show returns to Hillsboro Airport Sept. 20. Three years ago, the air show pushed back the show from summer to late September, which air show organizers help the show secure headline acts such as the Red Arrows.